MARCH 2016: While working on a project together, singer-songwriter Zoe Viccaji and actor-director Adnan Malik came across 25-year-old Irfan Ali Taj whose vocal abilities and slick playing of the rubab and guitar left them more than impressed. 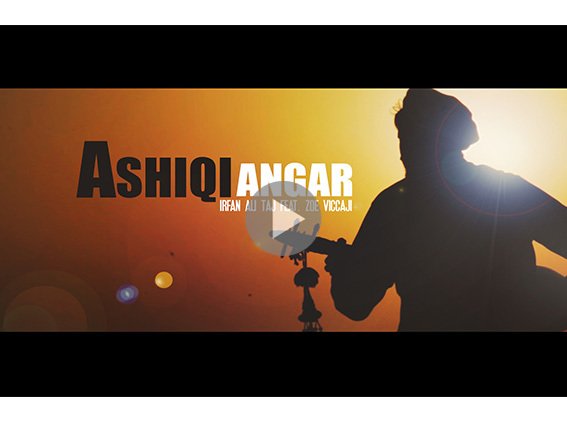 Months later, Viccaji and Taj were ready to put out their first ever collaboration together, Ashiqi Angar. Talking to The Express Tribune, Taj said the song was written by a fellow Chitrali songwriter, Mir Saleem, who is part of Taj’s former band, QashQarian. “The song really is the first to come out from the plains of Chitral into the mainstream. It has brought our music to the fore,” he said. The Urdu lyrics have been penned by Abdullah Haroon and Viccaji can be seen crooning to the lines in the video. With the Chitrali and Urdu lyrics both alluding to a longing for the beloved and the composition deriving heavily from folk music of the highlands, the video has ironically been filmed at a beach somewhere along the coastal part of Pakistan. Viccaji said the video, directed by Junaid Mustafa, was conceived on a shoestring budget. “On the other hand, the response it has received is amazing,” she said. Viccaji has every reason to believe Taj will soon make it big. “He has put in genuine effort. His heart is in the right place. I am sure more great songs will be coming out from his end.” The song has been produced by musician Mubashir Admani. According to Taj, the song delves into two different philosophies. “The Chitrali lines signify the concept of ishq-e-majazi whereas the Urdu lyrics denote ishq-e-haqiqi. The song talks about how love does not kill you but makes you stronger, making you capable of achieving bigger things in life,” he said. The upcoming musician feels very strongly about the literary tradition of his part of the world. He plans on reviving classical poetry inked by writers from Gilgit and Chitral through his music. “Not only do I want to highlight the struggle of these people but also to underscore the historical importance of the region.” Taj said he wants others to see Chitral the way he has seen it. With Ashiqi Angar already out, Taj is currently working on forming another band called Siachen. He has plans of releasing another single,Teri Talash, in which he will experiment with dhol, shehnai and other Eastern instruments. In his own words, it is a “masterpiece in the making”. Published in The Express Tribune, March 4th, 2016.